Enjoy a memorable night out in Vienna with this gourmet dinner and Mozart concert package. Savor a 3-course dinner and aperitif at the elegant restaurant Bristol Lounge, where Theodore Roosevelt once dined, followed by a Vienna Mozart Orchestra classical music concert at the Vienna Opera House. With performers dressed in period costumes and wigs, the Vienna Mozart Orchestra re-creates 18th-century entertainment with a selection of beautiful Mozart symphonies and operas. Undoubtedly Austria's most famous composer, Wolfgang Amadeus Mozart created some of the best-known symphonies, concertos and operas in music history. Though born in Salzburg, he found his home in Vienna, so where better to enjoy a concert of his masterpieces?Your evening begins at the restaurant Bristol Lounge, located in the Hotel Bristol in central Vienna. This historical hotel has hosted such distinguished guests as Theodore Roosevelt, composer George Gershwin, opera star Enrico Caruso and the Duke and Duchess of Windsor. Get settled at your table and sip an aperitif while soaking up the surroundings of this sophisticated Viennese restaurant. Then, enjoy your gourmet 3-course meal of Austrian and international dishes. Dishes are subject to change, but read on for a sample menu.When you’re finished with dinner, get ready to delight your ears! 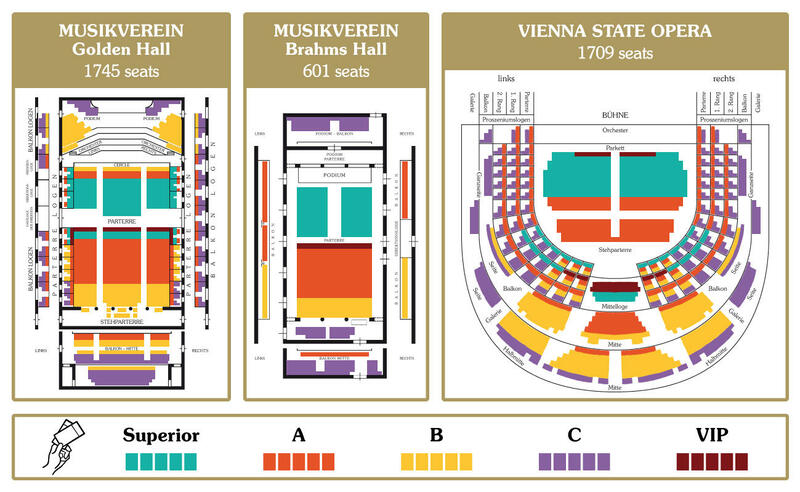 Make your own way to the nearby stately Vienna Opera House or Art Nouveau-style Vienna Konzerthaus — depending on the date you’ve chosen — and savor the excitement as you take a seat in your chosen area of seating. Performances at each venue are listed in the Itinerary and more dates will be listed as soon as they become available.The Vienna Mozart Orchestra will then delight you with an outstanding 18th-century-style performance. Listen to overtures, arias and duets from some of Mozart’s famous operas, such as Don Giovanni, The Marriage of Figaro and The Magic Flute, and hear movements from symphonies and serenades such as Eine kleine Nachtmusik and Symphony No 40. All the music is performed by talented singers dressed in period costumes and wigs and, for a little variety, they'll also play some music by Johann Strauss.Before leaving the concert hall, receive your complimentary CD, so you can continue enjoying your favorite Mozart tunes at home.